Don’t you feel kind of sorry for those drivers who are forced to have a 7 seat people carrier, because they’ve got large families? They never look totally happy, because driving a people carrier is the motoring equivalent of wearing a pair of beige cords, it says you’ve given up and to add insult to injury, most MPV’s look like a van with windows, and even though their lifestyle says they need the space, they would much rather be driving something different, something that would do the same job, but at the same time, give them back their identity and maybe send a message that they actually chose the vehicle they are driving, rather than being forced into it. Image is one of the first things that usually goes out of the window with the regular MPV and every driver who’s lifestyle says they to have one, knows they are called breed wagons, people movers or mini-vans and they know it sends the message out that they are your regular family Mr or Mrs, and whilst that’s OK, it’s a pretty much a universal truth that, because many of these MPV’s are so badly compromised by fitting the 7 seats, often they are not too good to drive and because of that, those of us that are not forced to drive one, kind of feel sorry for those of you who do. The market for MPV’s or SUV’s with 7 seats, is huge and almost every car manufacturer offers at least one, or something similar and we have been fortunate enough to test a good percentage of them and it’s on this we base our experience. Whilst their sheer size suggests you get lots of bang for your buck and indeed, if space is your thing, that’s true, there is another price you pay that isn’t in pound notes and its that so many of them are simply so horrible to drive and difficult to live with. Perhaps we are being hard here, as some of the most modern people carriers don’t look too bad now, and some of them even drive well, but fact is, many of them don’t, but Ford has come up with something that trumps them all and whilst its still got the seven seats that you can use everyday of the week, its dynamic, attractive and dam right desirable and its called the Ford S-Max. OK, its not new, as it was first launched in 2006, but its kept evolving, its kept getting better and frankly, today’s S-Max is that good, that you might simply choose it as your car, even if you don’t need the seven seats, because its very attractive, its got a great image and its really good at everything it does, so the seven seats would be just a bonus. We spent 10 days getting to know the S-Max. Our car was a 2.0 litre 203ps petrol Titanium with the ‘Powershift’ automatic gearbox, which was loaded with toys as standard, but for good measure our car had a number of options, including DVD touch screen satellite navigation, Power Folding Door Mirrors and a Titanium X pack which included extras such as Panoramic Roof, Alcantera/Leather seats, 18” 5 Spoke Alloys, Bi-Xenon headlamps and Ford’s wonderful Key-Free Entry System. Our car was finished in Panther Black metallic, and with its dark privacy glass, big alloy wheels and LED daytime running lights, it looked an awfully moody thing and we found ourselves looking back over your shoulder at it every time we parked it. The first thing you notice about the S-Max is its size. S-Max is longer than the compact MPV’s you see around, meaning that all of the seven seats can be used every day and not just occasionally as is the case with so many other 7 seat MPV’s and that’s an appealing feature and even with the middle row of seats slid all the way back, there is still an acceptable amount of legroom for the 3rd row passengers, although the headroom above the 3rd row of seats, might be a touch low for taller people. When you don’t need the full 7 seats, Ford’s ‘fold flat’ system makes it a one handed job, to drop the rear 2 seats into the floor, giving you extra load area, so there is no lifting out of heavy seats as there is in so many seven seat vehicles. Inside the car, all of the materials that Ford have used are high quality and its got a prestigious upmarket feel about the way it looks and the way its all put together and the lack of squeaks and rattles confirms that. The dash and switches are all logically laid out and easy to understand and use from the first time you drive the car, with everything visible and “easily turn-off-and-onable” to paraphrase ‘Creature Comforts’. The Sat Nav system in our car was DVD touch screen and worked as well and as easily as any navigation system we have tested, making it an absolute breeze to enter your destination, whilst the excellent map graphics and voice announcements made it so easy to follow a route, without taking your eyes off the road for too long. Our car also had a conventional handbrake (thank goodness) as we hate these electronic things. The S-Max we tested, had the ‘Powershift’ 6 speed automatic box which was effortless and one of the smoothest we have ever tested, with gear changes almost undetectable, however it does have a manual mode, which allows the driver to switch gears and of course, we tried this and it worked perfectly, but why would you ever want to use it manually when the automatic is so superb, it would be like being married to Kate Beckinsale, but then having an affair with Joan Rivers……..plain silly. We loved Ford’s ‘Key-Free’ system, which meant you could simply leave the cars key in your pocket and unlock (and lock) the car with just a touch of a button on the door handle and start or stop the cars engine using the engine start stop button, so easy and believe me, after using it for a few days, getting back into a car with a conventional locking and starting system, it was like going back to the stone age! Another thing we liked was Ford’s ‘Blind Spot Information System’ basically, sensors around the car let you know when another vehicle is getting close to you and that could be a car, van, truck or even motorbike and the system warns you by illuminating an orange light in the door mirror on the side that the approaching vehicle is in your blind spot. Ford says the system makes longer journeys a much more relaxing experience, but to be honest, its more than that, it genuinely does tell you if someone you might not have seen is coming up alongside you. Whilst we can’t speak for anyone else, a straw poll here found that all of us had at some point nearly pulled into the right lane, in front of an oncoming vehicle, simply because we couldn’t see it in either the rear view mirror or door mirror, so good system Ford, well done. Our car had the optional Panorama glass roof and that’s a nice thing, however we found we liked the blind kept shut, which was just as well, because this is where we found our only problem over the 10 days with the S-Max and that was the electronic blind, which insisted on not retracting fully into the roof when it was opened, leaving 2 or 3 inches of roof blind dangling out and whilst I know that’s a fault (on this particular car), it’s a fault that can easily be rectified, but importantly, it’s the only fault we could find on our S-Max, and that cant be bad. Driving the S-Max is a delightful experience, you sit much lower than you would in a conventional MPV, its more car like and Ford clearly believe that just because you are stuck in school run hell, you shouldn’t have to sacrifice driving pleasure just because you need a practical car. Our car was the 2.0 203ps petrol and it was silent inside and I mean really really quiet, unbelievably quiet giving the car a real quality feel. The steering was pin sharp, with hardly any body roll and the S-Max sits on a superb chassis and suspension that offers a fine balance between ride and handling allowing you to do all the town and motorway stuff without a second thought, yet the S-Max allows you to throw it around on twisty roads, whilst rewarding you every inch of the way and for us, that was outstanding as we truly didn’t feel that Ford had compromised the cars drivability in any way and this is a stunning drivers car, by any standards, and we don’t mean just by 7 seat MPV standards. When deciding on if a car is a good car or not, most of us take a look at the badge on the bonnet and if its posh, well we think the cars going to be expensive, so it will be good (although, believe me, expensive, does not always mean good) but in the case of our S-Max, you wouldn’t need to have seen the badge or even know who made it, the car simply looks and feels like an expensive high end, high quality product, or to put that into street speak, “it looked the business”. S-Max starts at £20,140 for the 2 litre petrol Zetec, going up to £29,260 for the top of the range 2.0TDCi 163ps Titanium Sport X Powershift Automatic. Our car with its goodies rang the till at £27,769. Believe it or not, it’s harder reviewing a car when it’s a good car. We normally try to find things about the car which are either poorly designed, don’t perform well or just simply unpleasant. Even some of the worst cars we have ever tested have some good points and they are easy to find, but when all a car pretty much has is good points, you kind of feel a failure because you’re not being “investigative” enough, and not finding out the bad things that you should be telling everyone about, in other words, not doing our job properly. Well this was a difficult road test, because the S-Max is good news pretty much all the way and there was very little we didn’t like about the car and when considering what we were testing, we found ourselves completely forgetting the S-Max is a mega versatile 7 seat MPV and tested it and measured its performance as if it were a regular car and it ticked all of our boxes. For the car enthusiast that must have a 7 seat car, it’s a breath of fresh air. The S-Max does everything they need, it really works as an MPV, whilst it doesn’t look or not handle like a conventional 7 seat MPV, so it offers the best of both worlds, without compromising either and whilst its being referred to as a crossover MPV, its much more than that, it’s a breakthrough, it’s a car you would actually want, rather than merely need and this big Ford is justifiably carving out its own niche because of that. 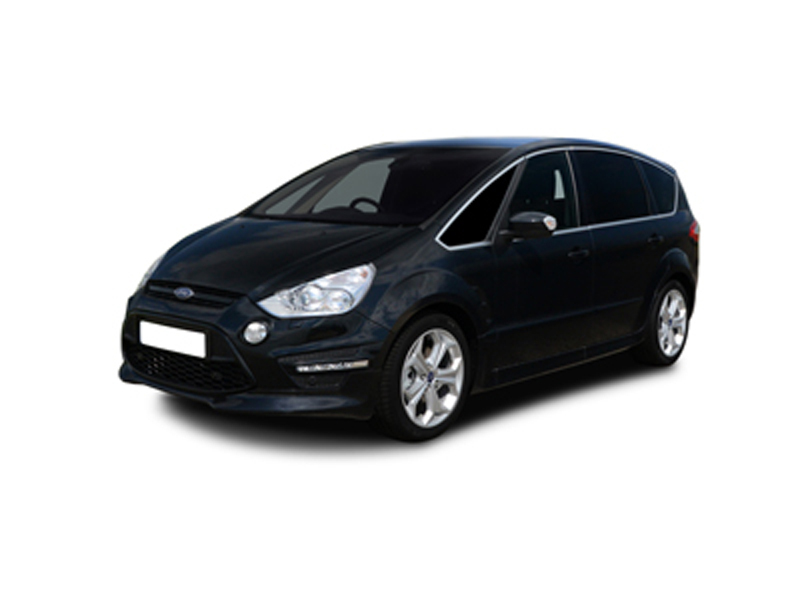 For a quotation on the Ford S-Max, or on any other vehicle, please contact us.